Reduce Gum Disease, Increase Overall Health? That’s A Good Idea! When you reduce or eliminate your gum disease, you’re increasing your chance of living a long and healthy life. That just makes sense, doesn’t it? Disease in one part of the body weakens other parts of your body. And even more than that, research has shown a strong link between gum health and overall health. And research has shown that the kind of oxygen-avoiding bacteria you get in your mouth can cause heart disease. How much more convincing do you need to keep your oral health in check? When you talk to a dentist about gum disease, you’re opening the door to a variety of advice and procedures that can help you overcome this important health issue. The first thing you need to learn is about brushing your gums. It’s just as important as brushing your teeth, and all you have to do is gently brush your gums with a soft brush before you add more toothpaste and brush your teeth. We recommend our homemade toothpaste for best results. Brushing gums pulls out bacteria from harmful pockets between teeth and gums and lets it be washed away. Traditional dentists also perform some barbaric procedure for which holistic dentists often have better alternatives. Traditional dentists perform deep scaling procedures that smooth and clean teeth so gums will adhere. They also cut away sections of your gums and the pockets that harbor bacteria, but this can cause sensitivity and pain, so it’s a procedure you should avoid if you can. When you have deep pockets of bacteria between your teeth and gums, you need to do everything possible to reduce or eliminate them. Pockets can be 6 to 8 millimeters deep or more, and using an O3 machine — like the one called the Ozonizer — can reduce these pockets in depth by 2 millimeters or more. That’s a remarkable difference. Dr. Vinograd had long been an advocate of oxygenating with an O3 machine the water you use to clean your teeth. This makes perfect sense because the kind of bacteria that are most worrying die in the presence of oxygen. Water already has some oxygen in it, of course, and adding more is easy to do. Here’s the recommended procedure: You get yourself an ordinary Waterpik, available online and from a variety of different local stores, like discount stores and drug stores. Just be sure you get a model with a reservoir, not one made for travelers. Then, get an Ozonizer. 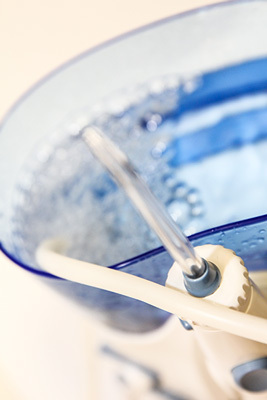 Use the ozonized water you create with the Ozonizer to clean your teeth, and you could get dramatic results. Of course, you should allow your dentist to monitor your progress and take measurements to see how things are going. You’ll be surprised how well this works. Get your Ozonizer at http://www.bodypure.com/product-p/ozonizer.htm. It’s a smart decision that could contribute to better overall health for you when you use it regularly and as recommended.